Thought to live in the remote forests of Eastern Africa, the Agogwe is often described as a small, 2 to 5 feet tall, human like biped covered in wooly rust colored hair and having yellowish reddish skin. The creature is often reported to have a rounded forehead, small canines and possessing small feet with an opposable big toe. Though reports are fairly consistent, some describe the Agogwe as having black or grey hair. The Agogwe is also known as the Kakundakari or Kilomba in Zimbabwe and the Congo Regions of Africa. In the late 1950s, Charles Cordier, a professional animal collector followed the tracks of the Kakundakari in Zaire. Cordier stated that once one of the creatures had become entangled in one of his bird snares. �It fell on it face,� said Cordier, �turned over, sat up, took the noose off its feet, and walked way before the nearby African could do anything.� The Agogwe is also know an the Sehite on the Ivory Coast, the Agogure or Agogue in Tanzania and Northern Mozambique and some researchers suggest that the Orang Pendek of Sumatra may be a related species of the Agogwe. It was suggested by cryptozoologist Bernard Heuvelmans that the Agogwe could be a surviving species of australopithecine, a bipedal primate known to have existed approximately 2.5 million years ago. 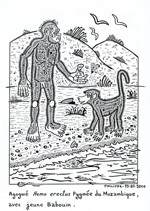 The description of the Agogwe does fit the known features of the australopithecine, with the exception of Australopithecine�s feet which did have somewhat diverged toe but far from the reported opposable toe of the Agogwe, however over millions of years it is conceivable that this toe may have evolved to become opposable. Another theory is the possible survival of gibbons in Africa. The gibbon, or lesser ape as it is sometimes called, are different from the so called great apes, chimpanzees, gorillas and orangutans, in that they are smaller, are pair-bonded, do not make nests and in some anatomical details in which they superficially more closely resemble monkeys. While matching the description of the Agogwe, including no tail and having a rounded forehead, gibbons are not known to live in Africa, instead preferring tropical and subtropical rain forests, mainly northeast India, Indonesia and China including the islands of Sumatra, Borneo and Java. Also gibbons rarely walk, instead preferring their primary mode of transportation, swinging from branch to branch in tree tops. However, the gibbon is certainly capable of walking on the ground, and when they do so walk on two legs. 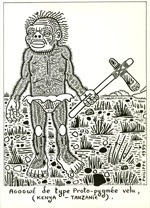 Some theorize that the Agogwe may also be an undiscovered species of proto-pygmy, a term used by Ivan T. Sanderson to describe the unknown hairy little people of the world. This term is still used today in the work of Mark A. Hall, Patrick Huyghe, Loren Coleman and others while researching and documenting cases of smaller than normal hairy hominids. Being that the Agogwe reportedly lives in the dense remote forest regions of Eastern Africa, no formal expeditions have been launched to locate this rare creature. Because of this there has been no physical evidence collected to support the existence of the Agogwe. In 1900, Captain William Hichens, while on an official lion hunting expedition, spots two small, brown, furry creatures coming out of the dense woods on the opposite side of the glade he was in, the creatures appeared very man like, about 4 feet tall and walked upright but where covered in a russet hair. In 1927, while on a Chinese cargo ship sailing close to shore along the coast of Portuguese East Africa, British Officer Cuthbert Burgoyne sports two little brown men walked together out of the bush. He described them as human like between 4 and 5 feet tall. Burgoyne also recalled a story a big game hunter friend told him of a time when he and his family where in East Africa and witnessed a similar looking family of these creatures, a mother, father and child. In the late 1950.s Charles Cordier, a professional animal collector, followed the tracks of what he believed to be an Agogwe in Zaire. Cordier stated that one of the creatures had become entangled in one of his bird snares, but was able to roll over, sit up and remove the noose before a near buy African could react.